Plants have been an important source of medicine for thousands of years. 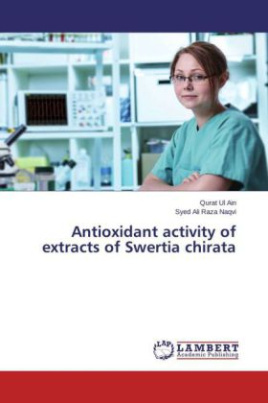 Plants are rich source of natural antioxidant i.e. tocopherols, vitamin C, flavonoids and phenolic compounds. Whole plant samples of Swertia chirata were purchased from the local market of Faisalabad, Pakistan. The dried and ground sample subjected for extraction by shaking method with different solvents i.e. 75% methanol and ethanol. In the present study antioxidant activity of plant Swertia chirata was investigated by measuring total phenolics (TPC), total flavonoids (TFC), DPPH (2, 2-Diphenyl-1-picrylhydrazyl) and Percent inhibition of linoleic acid peroxidation. The total phenolics (TPC) obtained from methanol 2.565g / 100g from ethanol 1.612g / 100g gallic acid equivalents. TFC obtained from methanol 13.247g / 100g from ethanol 10.948g / 100g catechin equivalents, inhibition of linoleic acid peroxidation obtained from methanol 94.04% from ethanol 93.05% and Percentages scavenging of plant Swertia chirata obtained from methanol extract 84.32% from ethanol extract 82.54%.